Brushing your teeth when you have braces isn’t that much different than brushing your teeth without braces. You still use a soft bristle toothbrush or power toothbrush and brush for a full two minutes. You still replace your toothbrush every 3 months, or sooner since the brackets on your braces might make the bristles wear down a little faster. You still brush around all the parts of your teeth, including the fronts, sides, backs, near the gumline and chewing surfaces. And you still brush your tongue and roof of your mouth. An end-rounded bristle toothbrush works well for brushing braces. Brush gently but thoroughly. If your braces look clean and shiny and if you can see the edges of the brackets clearly, you’ve done a good job! Make sure to rinse your mouth after brushing with water, or with a mouth rinse. Ask Dr. Davoody or Dr. Hablinski for a recommendation. Do the flossing for younger children who lack the coordination to thread the floss under the main wire of their braces. With braces, you have an appliance in your mouth that it simply isn’t used to. It may take a little time for your mouth, cheek, lips and tongue to get used to their new friend. To help alleviate some of the irritation, the assistants will provide you with relief wax. Simply pinch off a small piece and roll it into a tiny ball. 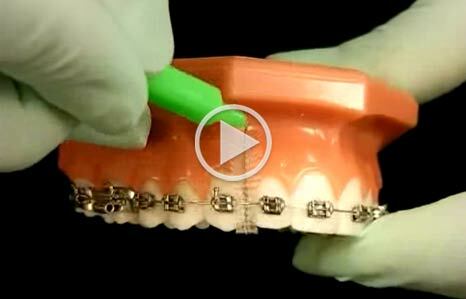 Flatten the ball and place it over the area of the braces that is causing the irritation. If the wax falls off, a piece of wet cotton wrapped around the offending attachment or even a small piece of orange peel can do the trick. You’ll be able to eat better, talk better, and feel better just by having a little buffer between your braces and your cheek or lip. If the irritation persists please call the office. You may need a little adjustment. Brackets serve as handles to hold the wire of the braces in place. Brackets are generally bonded to the teeth with adhesive. They are tough, sturdy and stable. But if you eat hard, crunchy or sticky types of food, the brackets can indeed loosen. If you get hit in the mouth, the brackets can loosen, too. That’s why you should ask Dr. Davoody or Dr. Hablinski about wearing a mouth guard during any and all types of physical activity. The arch wire of braces fits in the horizontal slots in each bracket. The wire is secured to all of the brackets, and occasionally, simply by the act of biting and chewing, the end of a wire will work itself out and cause irritation. The best way to alleviate the discomfort is to push the wire back down. Use a Q-tip or pencil eraser to push the wire back so it’s flat against your tooth. If you can’t get the wire back to a comfortable position, cover it with relief wax to have a buffer between your braces and the area of your mouth that’s irritated. In an extremely bothersome situation, and as a last resort, clip the wire. Reduce the possibility of swallowing the snipped piece by putting a folded tissue or piece of gauze around the area. Use sharp clippers and snip off the wire. Use relief wax if the area is still irritated. Make a follow-up appointment with Dr. Davoody or Dr. Hablinski to make sure the braces are still secure and to get a different wire if necessary.